Here the term “facts” is used loosely, as it only denotes statements that the entity submitting them believes to be true (or has put forward as true) and related to the main subject. The best way to understand this is to consider a legal case being argued in a Courtroom where each side will present their own set of facts. One party puts forward their evidence and arguments to back up their version of “what is the case in this case,” the other party puts forward their evidence and arguments. Each party thus puts forward their own set of competing “facts,” their own alternative facts. See: Alternative facts (law). Ex. “the Glove didn’t fit, therefore OJ is innocent.” That is an alternative fact, some would argue that isn’t true, but arguments aside it ultimately either is true or isn’t. Alternative facts are the justifications we give, they don’t speak to the object truth. With this in mind, “alternative facts” is also used in another sense, as a term coined by Trump’s White House counselor Kellyanne Conway to describe questionable information presented as facts. Here , an alternative fact holds pretty much the same meaning and is probably best described as a mashup of “alternative viewpoint” or “bias information” that is plausible. In other words, it is in some respects just the latest term given to information that isn’t purely designed to inform and/or isn’t purely true, that which we would otherwise call talking points. They are viewpoints that may be fully true with some important information missing, or just slanted. So, putting this together, alternative facts are competing sets of evidence and arguments. Despite this, there is still only one truth. Thus, in the court, or in the mainstream media, or at the press conference, objective truth is still king/queen. At least two sides will submit their “alternative facts” to make a case for “what the truth is,” and each set may sway the audience, but nothing about that process changes the object truth. The modern usage of the term may have originated on the political right, but it isn’t limited to them. Whether we say “Muslim ban” or “Muslim Extremist Terrorists”, in both cases, we aren’t purely using words to inform, we are using them to sway, and this is not the same as speaking fact. It is PR, it is marketing, it is Propaganda (which isn’t so different from what is happening in the court room where each side is putting forward their own set of facts with a purpose of persuading the Jury and Judge). This is similar to the concept of fake news too (in that it is a new term that basically just means “information + a specific viewpoint AKA bias”). And just like with fake news, and just like arguments in a court room, not all alt-facts are created equally. Should we just ignore this and chalk it up to PR? Although I’m tempted to just fallback to point 1, truth is important, since some of us consider the pursuit of truth and wisdom as one of the highest virtues, no different from the stance of Plato and Aristotle, we can say the situation merits scrutiny. Below we examine the concept of “alternative facts” to see if they are alternative hypotheses, counter arguments, differing opinions, spin, or flat out lies and if their purpose is to inform or not. This discussion of the different types of truths and types of information will help us understand a newly coined term like “alternative facts” from a centered perspective. “Sorry, Kellyanne, I’m not buying it. Alternative facts are not facts; they’re falsehoods!” -NBC’s Chuck Todd told Kellyanne Conway when she tried to defend Sean Spicer’s misleading and false claims about the size of Trump’s inauguration at his very first press conference (which took place during the biggest demonstration in modern history “the Women’s March“). As you’ll see below, not everything Spicer said was proven wrong, but he included enough falsehoods to spark the controversy. NOTE: To start, let’s note that Trump’s crowd size was average by all reasonable estimates. Some media portrayed it as small, and I think this triggered Spicer to lash out a little hard with the PR. Is this just an honest misspeak, or is it doublespeak? Time will tell. For now, our focus isn’t on Trump’s team; it is on the nature of truth and politics. UPDATE: The Media, shortly after these events, jumped on Conway for what I see as a misspeak (intentional or not) more than a fabrication and lumped it into the alternative facts conversation. 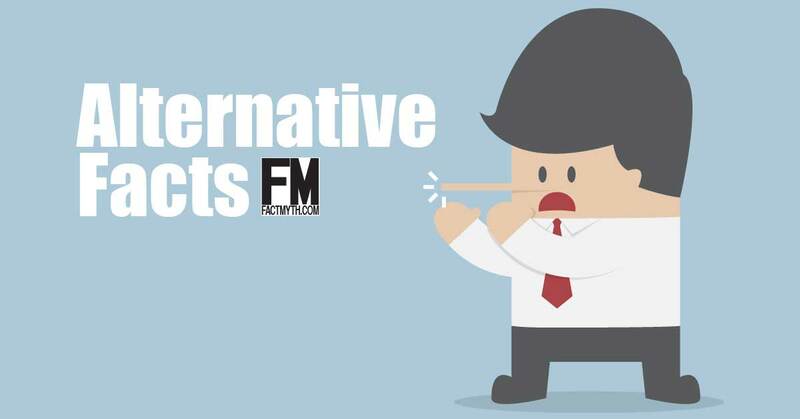 Topics like “fake news” and “alternative facts” speak to important concepts of our time, but one should note that some of what is called “fake news” isn’t purely fake and some of what is called “alternative facts” isn’t always pure BS. There is a world of difference between propaganda laced with half-truths and a single misspeak. Crying wolf at every flub is a sure fire way to create a bed of nails. Watch a timelapse of the National Mall on Inauguration Day. This time lapse video proves Spicer wrong in real time. Many in the media were nervous when something that is provably false is presented as true. To be fair to Trump’s team, charges of fake news aren’t always fully unfounded. Still, if the answer is “we need more honesty and integrity” Trump’s PR team is hardly setting the right precedent. We aren’t saying Spicer lied purposefully; we take his word he didn’t. Below is probably the best way to understand alternative facts. Are they a comparison of “two different versions of the weather report?” Is this like one weather man telling the truth, and the other misleading you with a different forecast (purposefully or not, based on justified belief or not). Obama had biggest in-person turnout for an inauguration. Trump had an average in-person turnout but perhaps had the largest world wide if views on the internet are counted. This was the largest audience to ever witness an inauguration — period — both in person and around the globe. Much bigger than Obama’s. Obama is an American Citizen. We don’t know, Obama could be a Muslim from Kenya. Hillary won the popular, Trump won the electoral college. There is no proof of voter fraud but legal voter suppression like gerrymandering and rules like winner-take-all skewed the vote in some states and districts. Trump Won the election by a landslide and he would have won the popular if it wasn’t for voter fraud. Before moving on, lets get a suitable definition of everything alternative facts could mean out of the way; then we will discuss all the nuances. We might say “alternative facts” is just a nonsense PR word that was given to justify a chunk of information that contained true claims, partly-false claims, purely false claims, or spin. In this light, it is just business as usual under a new President. With a kind lens, we may be seeing differing opinions on the same set of facts. If everyone saw everything the same way, we wouldn’t have two major political parties and a mostly split vote. As, while there is only ever one truth, one set of facts, one reality according to science and reason, PR politics is all about spinning the truth so hard it barely looks like truth anymore. That statement as written is a lie, not a purposeful lie according to Spicer, but technically a falsehood. A lie is intentionally told, so, giving the benefit of the doubt, it is an unintentional falsehood, as Spicer said didn’t mean to mislead the people. All the above claims are essentially more PR. In truth, Spicer used a basic PR trick of using ambiguous wording. Due to the rise of social media, Trump likely had the largest audience if we count all online and TV viewers, but his crowd size is estimated at a fraction of Obama’s. In truth, Trump’s crowd was average for a Republican. The crowd was filling the front (so it looked like millions from the front), but in reality, not filling the back or the streets, so turnout was lower than Obama’s. We have video footage proving this below. Still, this is just called “spin” and PR. You leave enough room for debate if you are caught using misleading words. We are dealing with PR and politics first and epistemology (the study of the nature of truth) and ethics (morality applied) second. So, here, Spicer was just using “heavy-handed PR tactics” that went a little too far and used some provable falsehoods. It is a bit shady, but to be human is to err, and people have room for improvement. With the above said, digging a bit deeper, we see less misspeak and more calculated doublespeak. So, an “alt-fact” is, from this perspective, the type of information you hear on something like Infowars. It is a half-truth framed from a populist anti-elite right-wing perspective. The alt-right have many alt-facts like Hitler was a liberal socialist, Hitler’s eugenics program is directly equatable with Planned Parenthood, the Civil War Democrats are exactly the same as modern progressives. From this lens, an alt-fact is just framing reality in a way that fits the alt-right narrative, whether or not the information is a truth, half-truth, or utter falsehood. This is the dangerous part. Is the administration trying to indoctrinate America with an alt-right ideology by spinning the truth? Will we have to disbelieve our own ears and eyes? Will we consider all MSM (main-stream media) false? Will those who stand up become proverbial Dixie Chicks? There is a valid and historically understandable fear of alt-facts from this perspective. Trust is earned, not brow-beaten. Trump’s team should not underestimate the tenacity of liberty loving Americans. We have all kinds here; some kinds will like the alt-facts, the others will either rebel or just ignore the hook and sinker. Trump’s 1/3rd minority with a majority in Congress is powerful, but it is less powerful than the wide support a Reagan or Eisenhower had. Some alternative facts could be described as justified belief or theory. You have facts pointing to a belief; you believe it; you say it. You can be shown to be wrong, but you weren’t lying by asserting your claim. I believe Trump believed his crowd might have been the biggest; he saw a big crowd. Still, we are talking about the U.S. government. We expect a certain degree of accuracy, and treating a belief as a fact is not “the most precise” tool in the rhetoric toolkit. Again, we expect PR, but we expect factual PR. When Obama said “you can keep your plan,” people didn’t just roll over; they lambasted him. The problem here is that filling people’s heads with contradictions is a manipulation technique. The fear is that some aspects of the Art of the Deal aren’t appropriate for PR, even if the people voted for that sort of rhetoric when it came to making deals on our behalf. We should not be able to quote 1984 to make points about the PR style used by Trump’s White House PR team out of the gate. The charge, and let us be clear, is that if it isn’t just an honest mistake, then we are seeing the start of a war on information and truth and a propaganda campaign meant to indoctrinate and confuse the American people. This is what 1984 is about. The majority of people don’t have a tolerance for such things. However, Plato pointed out that a majority isn’t needed. THIS is the fear, the fear that we are seeing a new era of propaganda. Still, this line of thinking insinuates the worry is real. The hope is that the mistake was honest and the reaction an over-reaction. LIGHT HEARTED: Urban Dictionary offers this definition: “When truth is so unfavorable to a pathological liar, that they must invent a whole new category of lies to describe their nakedly intentional acts of deception.” That is one way to frame it. Keep in mind Urban Dictionary relies on people to “vote up” definitions; take it with a grain of salt. Kellyanne Conway: Press Secretary Sean Spicer Gave ‘Alternative Facts’ | Meet The Press | NBC News. TIP: The term speaks to the times and the nature of information in the information age. In a world full of reality TV where, “fake news,” and “alt-right,” combine with the reality TV idea that “being good at business” is the highest virtue, it would be odd to expect anything else than a debate like this to arise. TIP: Some would argue this whole story is a distraction technique meant to take attention away from what is being estimated as “the largest day of demonstrations in U.S. history,” the worldwide women’s march. My claim that it is a distraction is opinion, and the claim that it is estimated to be the largest demonstration is fact. The women’s march wasn’t protesting Trump (although it was also about that given his expressed opinions of women and minorities); it was first and foremost about women, peace, love, unity, and solidarity in defense of women’s rights. In either case, the preliminary data is true, and this peaceful show of force for women’s rights was the biggest demonstration in American history. Let us admire the women’s march before moving onto a discussion about alternative facts, Trump’s PR team, fake news, and the nature of truth. Anti-Trump protests break out across D.C. This is what the anti-Trump protests looked like (they were small, local, and sometimes negative). Women’s March Floods Washington. This is what the women’s march protests looked like (they were “huge,” global, and positive). FACT: Another important point that may have been obscured is that Donald Trump Signed a Global Anti-Abortion Executive Order Surrounded By Men. The order defunded $600 million in annual funding for women’s health services around the globe. This could affect tens of millions of women. This is why the women’s march got so many millions to take to the streets. NOTE: I’m using language to make a point without lying; that is how proper PR and spin is done. Fact-check me and see; each point I make is a defensible, provable fact. I don’t need alternative facts to frame my argument for my base if anything they would hurt my argument. Trump also signed an executive order to start defunding the ObamaCare (the Affordable Care Act) and to withdraw from the TPP (a nativist protectionist stance). The term “alternative facts” was coined by Kellyanne Conway when she was asked by NBC’s Chuck Todd why White House Press Secretary Sean Spicer had presented provable falsehoods including one about the size of Trump’s inauguration at his first Press Conference following the inauguration. In this case, Spicer presented falsehoods. He, knowingly or not, presented falsehoods and spin for purposes of public relations. We can conclude that on one level “alternative facts” are misinformation, disinformation, half-truths, and lies used for the purposes of propaganda. They may not be differing conclusions based on scientific data, as weather reports are. From this frame, “alternative facts” and Conway’s claim that Spicer presented “alternative facts,” are both the same thing: spin and talking points, not a type of fact, but a type of myth. With that said, taking a step back from the gut level reaction to this use of propaganda, noting that Trump’s PR team is still getting their sea legs, and noting Spicer’s following corrections, we can give Conway and Spicer the benefit of the doubt. Let us discuss the validity of skepticism and reference frames as tools of those who love logic and reason and seek healthy debate. TIP: Propaganda is information designed to sway emotions rather than inform. Trump had accused CNN of being “Fake news” for spreading “unsubstantiated information” about him, and the press has not been favorable to Trump. It is likely Spicer and Conway are trying to counter what they feel is unfair reporting with a little spin, but the spin presented went overboard and, in some cases, became a falsehood. Falsehood is not an alternative to a fact; it is a lie. Everything Depends on Frame of Reference. There is Only One Truth. Giving Conway and Spicer the benefit of the doubt, we can view “alternative facts” not as an alternative to the facts, but as an alternative view on the facts (AKA opinion). After all, while there is only one set of facts, only one truth, and only one reality, there are countless ways in which to view a set of facts depending on one’s frame of reference. For example, Trump’s inauguration looked way more impressive from the front than from an aerial view of the back. Looking at different viewing angles of Obama’s crowd indicates how much perspective can complicate things. For another “perspective” see a comparison of the two inaugurations. However, when Spicer said [paraphrasing], “the CIA was very excited about Trump upon his visit” he was spinning and giving an alternative view. We can give alternative perspectives on facts, but we can never give alternative facts. We should note that there is no shame in presenting different perspectives on facts if it is done clearly and not conflated with fact. The shame is in not upholding our values and not telling people the truth. Anyone is going to be able to forgive CNN for a false story or Spicer for a false claim, but forgiveness and trust are earned. In the case of media and the President, a free press that seeks to inform the public will earn its own respect. Although we won’t debunk each Spicer claim here, below are a few bits of evidence to start you on your fact-checking journey (see politifact.com for more detail). First let’s consider this quote from Spicer’s 1/21/17 conference given just one day after Trump’s inauguration (on a Saturday, the same day the women’s march was taking place across the globe, just as it began to make headlines). “Inaccurate numbers involving crowd size were also tweeted. No one had numbers, because the National Park Service, which controls the National Mall, does not put any out. By the way, this applies to any attempts to try to count the number of protestors today in the same fashion…. This was the largest audience to ever witness an inauguration — period — both in person and around the globe. – You can read a partial excerpt of the Transcript of Sean Spicer’s statement here. Was Trump’s Inauguration both in person and around the globe? Spicer was right in that some media framed the reporting on the inauguration in a way that would, ” …minimize the enormous support that had gathered on the National Mall.” However, much of the rest of what Spicer says is half-truths and flat out lies. Specifically, he says “no one has numbers” and then says “this was the largest audience to ever witness an inauguration — period — both in person and around the globe.” How could BOTH be true? UPDATE: Both were not true. Spicer gave a follow-up to the 1/21/17 conference on 1/23/17 and clarified that the media had reported accurately and that he had reported falsely. According to MotherJones, “Toward the end of Monday’s lengthy press conference, Spicer conceded that the crowd in Washington was not the biggest ever and argued that he had never made such a claim. Instead, he said that by “both in person and around the globe,” he meant “total largest audience.” I’m not sure that is provable either (see here and here). *Note: Obama’s second inauguration was Jan. 21 instead of Jan. 20, which fell on a Sunday. As you can see from the data above, Trump had an average turnout for a Republican. This makes sense if you consider Republicans are favored by a rural minority in modern times, not a majority, and that Trump won based on the winner-take-all system, not the popular vote. It is likely the only way “total largest audience” is possible is if we count views on global social media. We should count social media as it is now much more prevalent than it has ever been. Press Secretary Sean Spicer Slams Media – White House Press Conference 1/21/2017. FULL -1/23/17 – Press Secretary Sean Spicer First White House Press Conference – Trump Briefing. TIP: When Trump heard about the turnout for the women’s march he said: “Why didn’t these people vote?” Of course, they did. Trump lost the popular vote. Later he corrected his language and said, “Peaceful protests are a hallmark of our democracy. Even if I don’t always agree, I recognize the rights of people to express their views.” Trump corrected himself and showed a willingness to respect American values. The hope is that Conway and Spicer will follow suit and step up to the plate. FACT: 1982’s anti-nuclear march in New York City drew an estimated crowd of 1 million. The 1963 Civil Rights March on Washington drew 250,000. 1969 anti-Vietnam war march in Washington was attended by an estimated 500,000-600,000. 1995’s Million Man March was attended by 400,000-1.1 million. In 1993, the LGBT March for equal rights had a crowd of 800,00-1 million. We don’t yet know how many attended the Trump inauguration. In the context of the way the term “alternative-fact” was used by Conway, an alternative-fact is an opinion or hypothesis. Or more specifically, in context, it is counterfeit information meant to spread falsehoods and sway opinions. It is propaganda, PR, a talking point. The fact was that fewer people attended Trump’s inauguration, but the media exaggerated the point by showing images from specific angles and not others. We can assume that the media did this because Trump keeps calling them “Fake News” and hints at state-run media. We have to understand how information works. What is a Fact? A fact is an objective and verifiable reality; it is something that can reasonably be proven true. What is a Myth? A myth is anything that is not fully true. This includes all counterfeit information, all talking points, and any information presented as true that isn’t objective and verifiably true. What is a Hypothesis? A hypothesis a proposed explanation based on facts. A hypothesis becomes a “good” theory if it can withstand testing and has enough facts pointing to it. What is Truth? Truth is something that is the case, even if we can’t verify it. There are many different types of myths. A theory is based on fact, but can be proven untrue and replaced with a better theory. Theories, facts, and hypotheses are all different things. Facts will almost always turn out to be true, but, in some cases, they can be proven to be myths if better data comes along. We used to think the world was flat. Then we figured out it was round, but some still believe it is flat. Those who still say it is flat aren’t presenting “alternative facts,” they are making hypotheses. Everything else aside, there is only one type of truth. Everything is always true or untrue, even if we can’t prove it. There are cases where we think we have a fact, but through a healthy skepticism and the scientific method we discover a better fact, and we can have a great theory that ends up not being true, but this is different than spreading a provable falsehood knowingly. TIP: Manipulation is a PR tactic where you purposefully confuse the public by using counterfeit information. For example, you call CNN fake news; CNN reports that alternative-facts are lies, and then “oh, dear” people don’t know what to believe anymore. 1/3rd of America believes CNN, 1/3rd thinks CNN is fake, the other is just confused and wants it to stop. The person behind the PR doesn’t need you to believe their lies; they only need you to question information and sources that provide that information. This WWI – WWII era tactic was used by the Russians and Germans but was originated by Western thinkers and intelligence. Propaganda is an important part of world history. Our enlightened ancestors and our intelligence community, the ones who opened this Pandora’s Box in modern times, know how to tell the difference between real and counterfeit information. They know how to apply Hume’s fork logic and the scientific method to data. We already have the tools to protect against misinformation. TIP: The term counterfeit information describes information designed to look real, but that isn’t real. It is meant to sway people emotionally, not to inform. Propaganda is a type of counterfeit information told purposefully for any purposes other than “to inform.” Of course, not everyone who spreads a falsehood knows they are presenting counterfeit information. Sometimes fake information is spread, but the intent is to spread real information, things get complex. There is only ever one truth, but certainly we can all put together our own sets of facts and argue for our version of the truth despite this. It is human nature meets the nature of information, pure and simple. We can be a skeptic, and we can question facts, come up with a reasonable hypothesis, create a theory based on facts, and test our theory. This is the scientific method. In a court room there is a duty to perjury, in politics there is no such duty. This is the problem and the difference. Consider Christianity with its 30,000 or so denominations, sects, faith groups, traditions, etc. All teach different beliefs. There can be either zero or one true group. All the other tens of thousands of Christian groups are teaching at least some alternative facts. The probability of a given person belonging to a group with the fullness of truth is miniscule. Interesting points. We all probably believe some alternative facts, but we don’t all work as a mouth piece for the Federal Government in a position of authority in which our words matter. I expect a higher level of critical thinking from some groups. When people go to a source for facts, and it can be reasonably expected that facts will be provided, it is in this situation that spreading “alternative facts” is perhaps the most problematic. Imagine being in the military, being stuck in a survival situation, opening up a field guide, and instead of getting pure information you get opinion, rhetoric, and a complex and obscure answer on which berries to eat to survive out in the wilderness. That would be absurd, surreal, and dangerous. If a Christian tells me about God, I assume they are speaking about faith. If the State Department tells me a fact or figure, I assume they are trying to convey true information. I’d like to be able to assume that about the press, the dictionary, and other reasonable sources.